TME assortment is very rich and the majority of 100 000 products is available on the spot. Nevertheless, not all articles in our offer are available at a given moment in the warehouse. 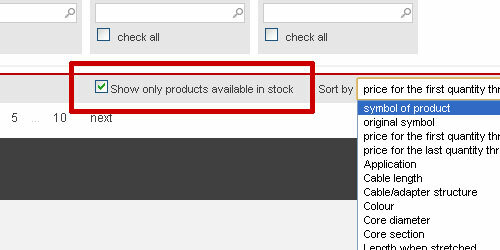 For those customers who wish to know which of the searched products are currently available and can be quickly delivered to the indicated address, we have introduced an option of filtering according to stock levels in the warehouse. Note! Filtering occurs according to data that can differ from actual data displayed on the Website.